Murray Hill residents started a Facebook page called Third and 33rd (and Beyond) to discuss the homeless encampments in their neighborhoods and post photos. This picture of a man urinating was posted to the group. NEW YORK CITY — The city will send out teams of outreach workers to canvass most of Manhattan to be more proactive in dealing with the homeless crisis and respond to 311 complaints about the issue within an hour, Mayor Bill de Blasio announced Thursday. The mayor revealed the "HOME-STAT" plan at a speech to the Association for a Better New York at the Grand Hyatt in Midtown. 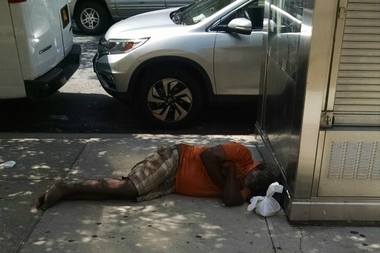 "Every single day, city teams will inspect hot spots of street homeless activity by covering every single block from Canal Street to 145th Street in Manhattan, and specially selected areas in other boroughs," de Blasio said. "We’ll have the most up-to-date, specific data on the street population we’ve ever had," he continued. "And we’ll perform rigorous analysis of that data to determine what people need, what’s working, and what’s not — helping us take important steps to keep street homelessness down in the future." Under the plan, the city will conduct quarterly nighttime counts of the street homeless. Currently, there is one annual count in winter when the number of people living on the streets is at its lowest. Last year's count put the number of street homeless at around 4,000, a number that advocates say is not reflective of the total street homeless population. The response team to deal with 311 complaints about homelessness will grow to 312 from 175 and the NYPD will add 40 officers to its 70-person homeless outreach unit to respond to calls about encampments and reduce the response time to complaints of emotionally disturbed homeless individuals to an hour. The changes come days after the resignation of Homeless Services Commissioner Gilbert Taylor and the announcement of a comprehensive review of the way the city delivers services to the homeless. The initiative, which the city touted as the "most comprehensive street homelessness outreach" in any major city, comes after criticism that de Blasio was slow to respond to the problem. Now, city workers will be in touch with all of the city's "street homeless constantly," said de Blasio, who also used the speech to try to place the homelessness issue in context, adding that there were already more than 50,000 people in shelters on his first day in office. "This is a fundamental change in how our city contends with a situation that has been intractable for so many years," de Blasio said. The truth is that no city in this nation has cracked the code and figured out how to solve this crisis." The money for the effort will come from the existing Department of Homeless Services budget, the city said. Mary Brosnahan, president and CEO of Coalition for the Homeless, said in a statement that the mayor's actions on homelessness this week were "bold" and would eventually "bring thousands of homeless New Yorkers in off the streets and into permanent housing." But Arvernetta Henry, a leader at advocacy group Picture the Homeless, said the proposal does not solve the real problem. "The mayor needs to stop putting a Band-Aid on the situation," she said. "We don't want to be on the street. We want permanent housing."